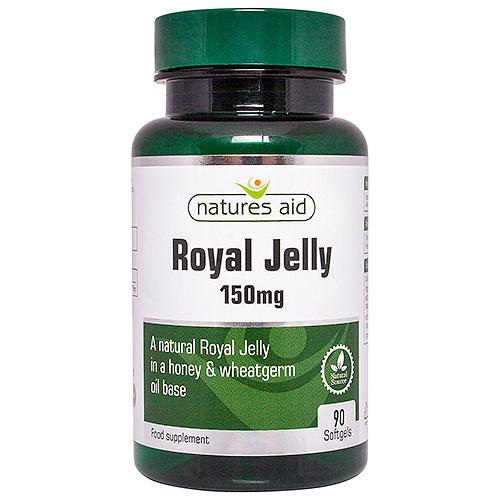 Natures Aid Royal Jelly is the nectar produced by bees as food for the queen bee. Royal Jelly is a rich source of B-vitamins, minerals and trace elements such as copper, iron, phosphates, potassium, silicon and sulphur. Wheatgerm Oil, Gelatin, Acacia Honey, Glycerine, Royal Jelly, Lecithin (product of soya), Beeswax. Free from: Artificial Flavours, Colours & Preservatives, Lactose & Yeast. Take 1 softgel per day with food. Below are reviews of Natures Aid Royal Jelly - 90 x 150mg Softgels by bodykind customers. If you have tried this product we'd love to hear what you think so please leave a review. My husband used to take a Royal Jelly product that is sadly no longer available and which he felt was doing him good. Since then, we have tried various other products, this being the latest, but it is impossible to say whether these softgels are effective or not as my husband is coping with a number of ailments and medications at the moment. All we can say for now is that they haven't made a noticeable difference but they haven't done him any harm! They are easy to swallow. This is the first time that I have used this product. One softgel per day is a small amount of anything for me to feel a difference. I will carry on for another two months and then make a decision. excellent product. Best on the market.